Childcare available at the church building from 5:00-6:30pm up through 5th grade. Happy Valentine’s Day Saylorville Couples! Let’s face it – sometimes life gets crazy and quality time with each other gets squeezed out. 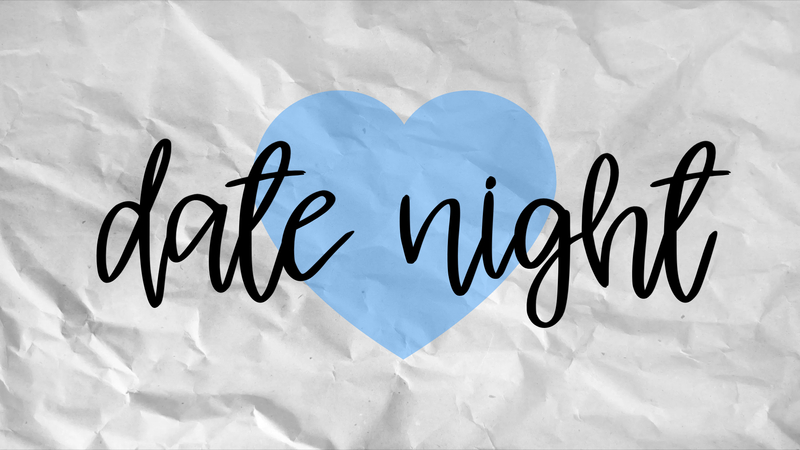 Hopefully, this #SaylorvilleDateNight will give you an opportunity to reconnect with one another, even if it’s just for an hour or so. In fact, before the night is over, make plans for your next date. Pro tip: Don’t wait until next Valentine’s Day! Wanna win a free date for the future? Take some selfies of your evening together and post them to Facebook or Instagram using the hashtag #SaylorvilleDateNight. We’ll pick our favorite pictures and award some sweet prizes. Looking for something close to home? Watch the sunset over Saylorville Dam. Be there before 5:40pm or you’ll miss it! Share a basket of chips and salsa at Chilis. For a special treat, try the salsa and ranch dressing combo. Get a quick workout or swim some laps together at Trail Point. Hit the arcade or bowl a game at B&B Theatre. Grab a few legendary breakfast tacos at Fuzzy Taco. Create your new favorite ice-cream flavor at Sweet Swirls or Cold Stone Creamery. Relive your college days by grabbing a slice at Leaning Tower of Pizza or Wig and Pen. Stop by Main Street Cafe, Starbucks, or drive down to Des Moines Brew for coffee and conversation. Order a couple deadly milkshakes at Zombie Burger Shake Lab. Swing through Krispy Kreme for a dozen originals. Save none for the kids. Go home. Seriously. Drop your kids off and go home for few minutes of alone time! Got a little extra time? Head out to Smash Park in West Des Moines for some Pickleball and other games you’ve never heard of. Share a bucket of balls on the indoor driving range at Range Grill and Golf. Got some time in the afternoon? Hit the East Village for a variety of hip boutiques and restaurants. Be sure to stop at Molly’s Cupcakes, Porch Light Antiques, Des Moines Bicycle Collective, and Horizon Line Coffee. If you live in Des Moines and you’ve never seen the view from The Republic on Grand, you really should check it out. While you’re there, try the dry cured chorizo flatbread. Did you know Des Moines has an indoor raceway? Check out Pole Position go kart racing for an experience you’ll never forget! Feeling really adventurous? Go all-in at Climb Iowa, the Des Moines Escape Chambers, Ironside Axe-Throwing, or Ice-Skating at Brenton Skating Plaza. When do you remember laughing with me the most? What’s one time lately that I’ve made you feel great about yourself? How can I do that more often? What’s a favorite memory from when we were dating? What made it so great? Who was your favorite teacher in elementary school? What did you like about him or her? What’s your most embarrassing memory from junior high? Who is your favorite relative from my side of the family? Who do you miss the most who is waiting for you in heaven? Who are you most like – your father or mother? In what ways? When did you first get that definite feeling, “God is here. He is real.”? Where were you? What were you doing? What prayer have you been praying for years – and wonder how God will answer? What’s your favorite Bible verse (even if you can’t remember it word perfectly)? Why? What’s your favorite song that we sing in church? Why do you like it so much? Name two things you want to be remembered for. How can I help you develop those two things? What dream have you put on the back burner? Do you think it’ll stay there forever, or would you like to still live it out one day? How can I help? What’s your idea of a perfect vacation? What would we have to do to take that vacation? Want to print these questions out to take with you on your date night? Download them here.